Kaneta Masanao's work is in major museums throughout the world. He is widely recognized as the foremost Hagi ceramic artist, and one look at this wonderful cup and saucer will tell you why. 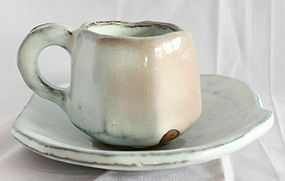 Saucer: 7 inches (18cm); Cup 3h x 4.5w inches (7.5h x 11.5w cm). A Beautiful Ode to Longevity by Watanabe Gashin, born 1944. Watanabe Gashin is a renowned calligrapher who has won many awards for his Japanese calligraphy. In this unique work, he spells out the joys of each decade, from the age of 60 to the age of 111. Frame: 36.5 x 18 inches, 93 x 46 cm; Calligraphy: 25 x 12 inches, 63.5 x 30.5 cm. 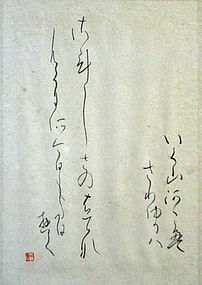 Yuasa Koufuu is an accomplished Japanese calligrapher. She is the recipient of many honors and prizes in Japan. Her style is very graceful and reminiscent of the famed Edo Period master, Rosetsu. In this delightful piece, Yuasa Koufuu describes the beautiful scenery in a mountain river. Frame: 20 x 14 inches, 51 x 35.5 cm; Artwork: 13 x 9 inches, 33 x 23 cm. Rare Image by Japanese Woodblock Print Artist, Saito Kiyoshi (1907 - 1997). The Saito Kiyoshi Museum in Japan is devoted entirely to the work of this artist, and his work is in many other museums, including the Cincinnati Art Museum, the Philadelphia Museum of Art, and the Art Institute of Chicago. His work was exhibited at the Salon Printemps in 1948, and in 1951 he received first prize at the inaugural Sao Paolo Bienniale. 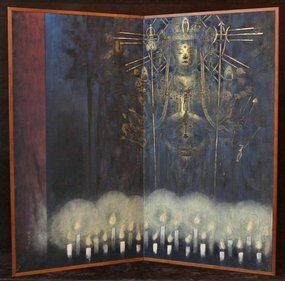 Influenced by Piet Mondrian, Pablo Picasso, Henri Matisse, Wassily Kandinsky, Paul Gauguin, Odilon Rodin and Edvard Munch - among other famous artists, his unique images combine traditional Japanese elements with Modern, Cubist, Abstract and Impressionist qualities. Frame: 26.5 x 21 inches, 67.25 x 53.25 cm; Print: 22 x 16.5 inches, 56 x 42 cm. From the collection of Irwin Hersey, renowned author on Asian and primitive art, and publisher of the Primitive Art Newsletter in the 1970s. Irwin Hersey was an advisor to museums and prominent collectors, and vetted pieces for many of the international tribal art fairs and Asian art fairs. Rare Image by Japanese Woodblock Print Artist, Gen Yamaguchi (1896 - 1976). 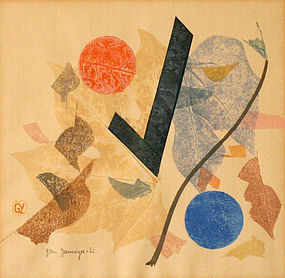 Yamaguchi achieved an international reputation when he was awarded first prize at the International Print Biennale in Ljubljana, Yugoslavia, 1957, and a grand prix at Lugano, Switzerland in 1958. He experimented constantly, manipulating his materials and images as he sought to achieve innovative results. The Gen Yamaguchi Memorial Prize is now a top prize in Japan for woodblock print artists. Frame: 19.5h x 18w inches, 49.5 x 45.75 cm; Print: 11h x 11.25w inches, 28 x 28.5 cm. From the collection of Irwin Hersey, renowned author on Asian and primitive art, and publisher of the Primitive Art Newsletter in the 1970s. Irwin Hersey was an advisor to museums and prominent collectors, and vetted pieces for many of the international tribal art fairs and Asian art fairs. Landscape Oil Painting by Ryonosuke Fukui (1923-1986), purchased directly from the artist in Japan in 1962. Excellent Condition. 16.5 x 13 inches, 42 x 33 cm. Maquette (scale model) of Faun Sculpture by Yasuhide Kobashi (born 1931), commissioned by Lincoln Kirstein for the Lincoln Center for the Performing Arts in its opening years. Purchased directly from the artist at the time the sculpture was first displayed in Lincoln Center in the 1960s. Signed on the Bottom of the mount. Kobashi's works are in the permanent collections of many major museums, including the Cleveland Museum of Art, the Metropolitan Museum, the New York Public Library, the Weisman Art Museum, and the Neuberger Museum of Art. In 1965 along with Jackson Burke, he designed the space for the display of the Burke Collection, one of the greatest collections of Asian art in the West. 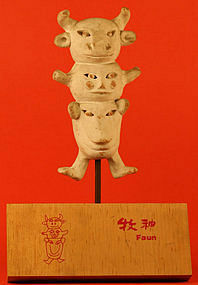 Japanese Musha Ningyo of Shoki the Demon Queller, made by	Beishu. Beishu has Mukei Bunkazai status (Important Intangible Cultural Property). 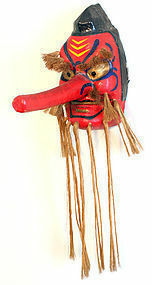 His Shoki shows great craftsmanship, with silk hair, glass eyes, gofun face and hands, with sumptuous silk brocade. This magnificent sculpture reaches the level of the master work of Beishu, whose work is found in museums and important collections of the Showa Period in Japan. Signed and dated 1960. 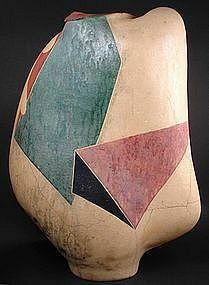 21 inches (53.25cm) high. 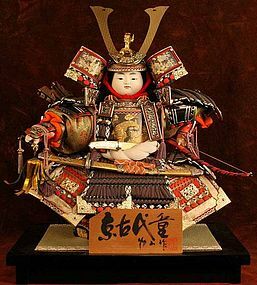 Japanese Musha Ningyo of Jimmu, the First Emperor of Japan, made by Beishu. Beishu has Mukei Bunkazai status (Important Intangible Cultural Property). 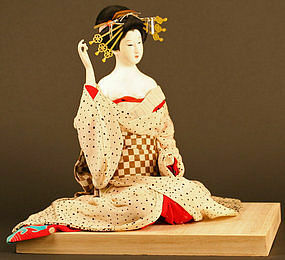 His Shoki shows great craftsmanship, with silk hair, glass eyes, gofun face and hands, with sumptuous silk brocade. This magnificent sculpture reaches the level of the master work of Beishu, whose work is found in museums and important collections of the Showa Period in Japan. Signed and dated 1960. 20 inches (51cm) high. 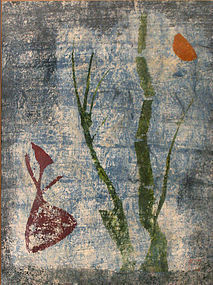 This beautiful contemporary Ningyo is by an important artist, Nishikitsuka Moeharu. 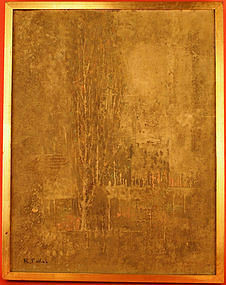 His Kimikomi style of work has been exhibited in many galleries and museums, including the Homma Museum in Japan. She is holding peach sprays. Carved of wood with applied silks brocades. She has a sensitively rendered face with carved lacquered hair adorned with a gold hair ornament. 9 inches (23cm) high. Base: 10.5 x 8.25 inches, 27 x 21 cm. Japanese Isho Ningyo of an Oiran, the most important Geisha of the Kyoto Geisha quarter. The book and movie 'Memoirs of a Geisha' is the story of an Oiran. This master work is truly a work of art to behold, and is by one of Japan's foremost doll makers, the late Ito Hisashige XI. 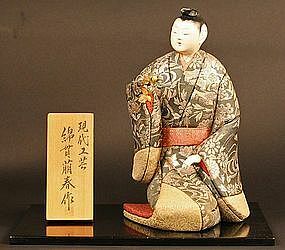 The first Ito Hisashige was appointed to the position of Court Doll Maker by Emperor Gosakuramachi in 1767. This long unbroken line has continued in this position, making some of Japan's finest Ningyo for 12 generations. This fine example was made in the 1940s. We have never seen an Oiran bearing her breasts, one of the many beautiful aspects of this very special Geisha Ningyo. 14 inches (35.5 cm) tall with 14 x 12 (35.5 x 30.5 cm) base. Excellent Condition.